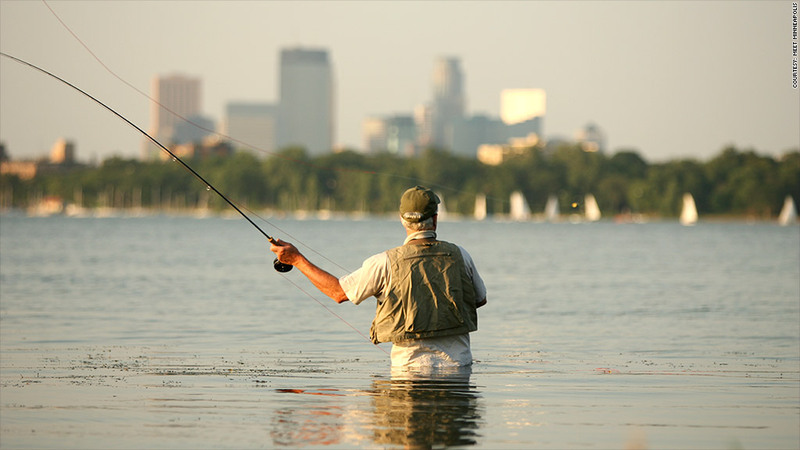 The winters may be a bear, but Minneapolis' residents enjoy a quality of life that's hard to beat. Less than 11% of the city's residents live below the poverty line, one of the lowest rates of all 55 metro areas that CNNMoney analyzed. Unemployment is also low, due in part to a number of large Fortune 500 companies, ranging from Target (TGT) and Best Buy (BBY) to Hormel Foods (HRL) and UnitedHealth Group (UNH). "The biggest stress point for someone is, 'Do I have a job?' and here, most people are able to find work," said Todd Klingel, president of the Minneapolis Regional Chamber of Commerce. Related: Stress factors: Which city is for you? Residents feel pretty great, too. Only 11% of residents surveyed by the Centers for Disease Control said they were in fair or poor health, and smoking is less common than in many other cities. That could be helped by the region's many state-of-the-art health care facilities, including the nearby Mayo Clinic, as well as a wealth of parks and bike paths. But there are some downsides: Like many Midwestern cities, binge drinking is more common here. And commuters often face traffic headaches thanks to above-average congestion. "The region is growing quickly and our transportation infrastructure has not kept up," Klingel said. Though he noted a new light rail network could help.